Saving gets us genuine growth, credit expansion gets us boom and bust. The Austrian theory of the business cycle emerges straight-forwardly from a simple comparison of savings-induced growth, which is sustainable, with a credit-induced boom, which is not. An increase in saving by individuals and a credit expansion orchestrated by the central bank set into motion market processes whose initial allocation effects on the economy's capital structure are similar. But the ultimate consequences of the two processes stand in stark contrast: Saving gets us genuine growth; credit expansion gets us boom and bust. 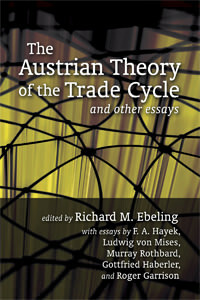 I would recommend this to anyone who is curious about Austrian Business Cycle Theory. This follows the different presentations of ABCT throughout the 1920-1977 era. It's not as much detail as would be necessary for a complete understanding. But it is a good start to get the most crucial ideas down before proceeding to a treatise on the topic. This is a great collection of essays. This collection was actually first published in 1978 by the Center for Libertarian Studies (whatever happened to that group?) as the 8th in their "Occassional Papers" series of monographs. This edition reprints that one exactly, but also adds in a new intro and summary by Roger Garrison and an index. Mises article first appeared in 1936. No idea if it has been reprinted elsewhere in the authors works. Haberler's article first appeared in "Gold and Monetary Stabilization" in 1932. Rothbard's first appeared as a small booklet by itself, and this has recently been reprinted by the Mises Institute. Hayek's was given at an FEE event in 1970, and published for the first time in this work. No idea if its been reprinted elsewhere.